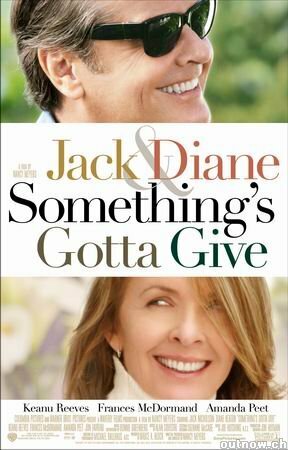 Something's Gotta Give Movie Set Decor - updated! 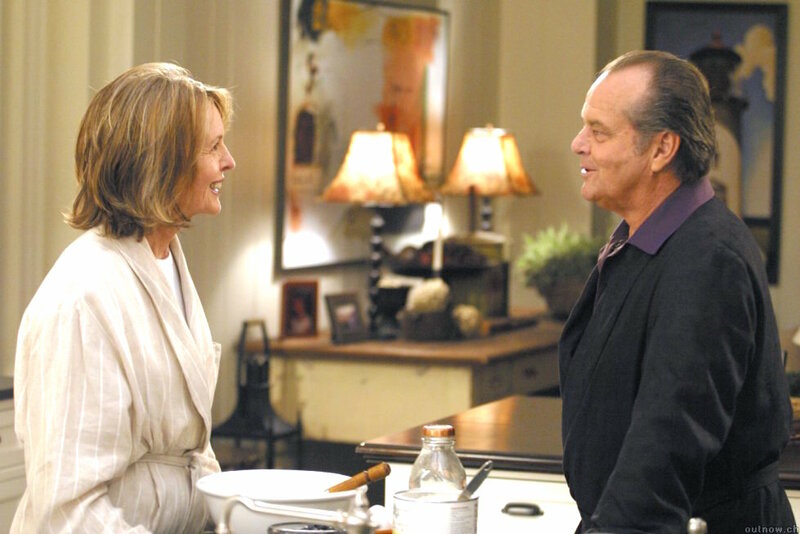 Way back – 10+ years ago now – I was inspired to start posting about movie set decorating by the then four year old movie Something’s Gotta Give. I saw it on a flight coming back from Paris (when I went to Maison et Objet) and thought – gosh, that’s a pretty movie set – I should write a blog post about it! It’s not overstating things to say the various posts I did about the movie have been my most popular, got me interviewed in major newspapers, introduced me to new friends and opened some doors to me that may not have been opened otherwise. Through a circuitous route too long to go into, it’s the reason I was able to make a trade agreement for all new kitchen appliances when I made over my own condo kitchen. I still get a significant amount of international website traffic and even the occasional question related to the movie. Meanwhile, all my posts have become stale, images have gone missing, links broken. In other words, they’re a mess and I always feel badly when I see someone has looked at a certain page only to see half-baked (over-baked?) information. So, given the important role the movie has played in my blogging career and how influential the movie set decor was in general, I decided to combine and update all the old posts into one big one. Unlike when I started, I now know what everyone seems to want to know and will attempt to include everything I know based on web searches and inquiries. I will also add links at the end to some of the best posts and articles from the past ten years from fellow bloggers and other news outlets. Here we go! Color and other movie fakery! By and large, the single most asked question about this movie is: what is that color on those walls??? And guess what? I cannot answer that question because they didn’t use household paint! 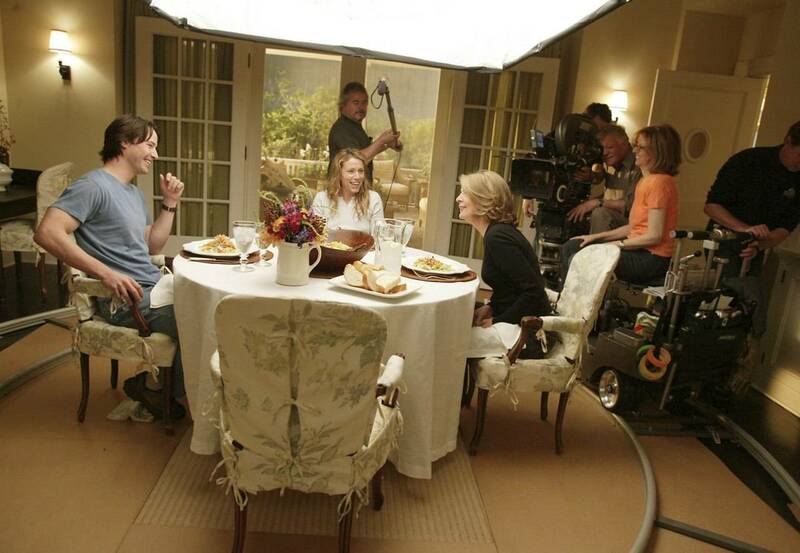 Those fabulous house interiors were built entirely on a sound stage and because of that, there was no natural light. All the light – the feeling of light streaming in from the open windows – everything was movie magic. And because there was no natural light or the normal lighting one would find in a home, the paint on the walls had to be formulated to look a certain way with movie lighting and recorded onto film. We got this from the horses mouth, so-to-speak, set decorator Beth Rubino, whom we interviewed on the podcast The Skirted Roundtable. It’s disappointing news, to be sure, but it’s true! In the same spirit, the floors and the kitchen countertops were also not as they appeared. 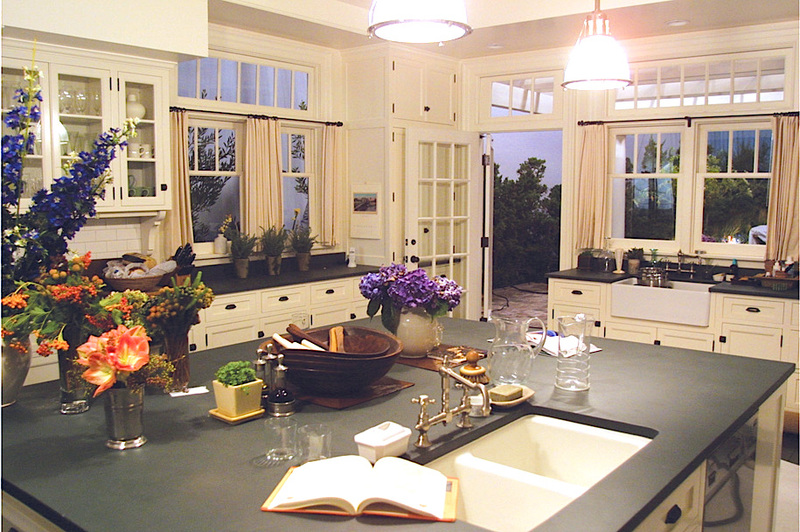 The countertops were faux painted to look like a greenish soapstone and the floors were faux painted to look like a glossy dark stained wood. The value of filming on a movie set is that they can build the sets to be moveable so that cameras, people, etc. can be moved in and out as needed. Also, take note the different sizes of the tables from above and below. It’s all in the perspective of the camera’s eye! Is really just a make believe wading pool! A close second when it comes to web searches and requests for information was about the artist R. Kenton Nelson. 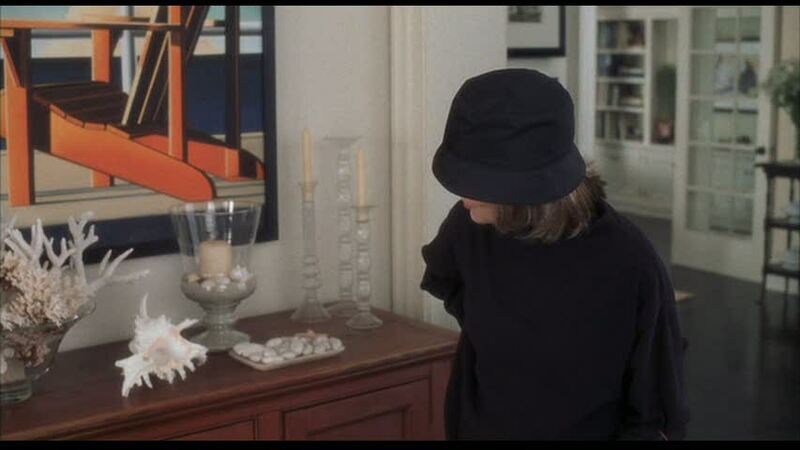 Several of his pieces were used in the set of the movie – some from Diane Keaton’s personal collection. 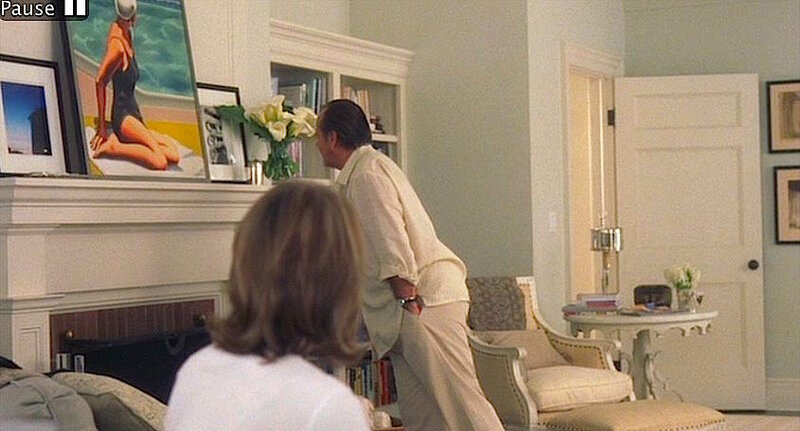 However, clearly director Nancy Meyers is a fan, as another work can be seen in Mel Gibson’s characters bathroom in the Nancy Meyers film What Women Want and I think I recall seeing a piece in one of the Father of the Bride movies as well. One of the disappointing things for fans ten years ago was that Mr. Nelson wasn’t selling prints of his paintings. The good news is that he is now selling limited edition giclee prints of some of his works, though they are still quite expensive. And, not surprisingly, they are sold out of the two prints seen in the movie! There are also some very well priced posters available (though not of the same pieces seen in the movie) as well. His style is so unique – I just love it. 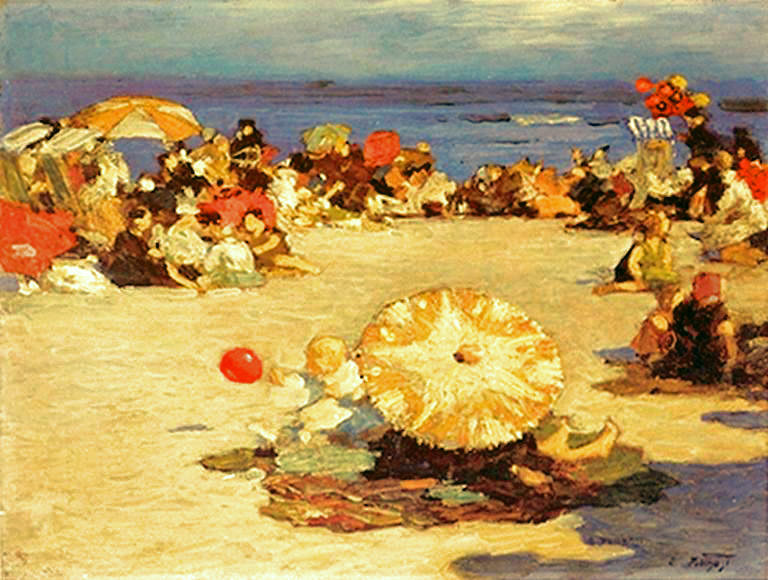 Over the mantel is said to be a reproduction of “Rockaway Beach” by Edward Henry Potthast, an American Impressionist painter who painted many seaside pieces. Actually, there is a bit of a mystery here. While there are many similar Potthast prints available, this specific one seems fairly elusive. It doesn’t even show up on the Potthast website which claims to show his complete works or on Athenaeum.org, which shows 303 paintings by the artist and who owns them. My original post said this reproduction was provided by Film Art, L.A, which provides art to the movie industry. This information is included in the Set Decoration Society of America’s story about the set decor in 2004. This painting certainly is in the style of Potthast and the signature looks like his (though I am not any kind of expert in these things). So, I wonder if this piece was created to be in the style of Potthast, but wasn’t an actual Potthast? I don’t know and am not sure why when there are so many prints available online. Possibly because they wanted to depict the piece as original art? I’ll update if I learn more or, if you know more, please let me know in the comments! 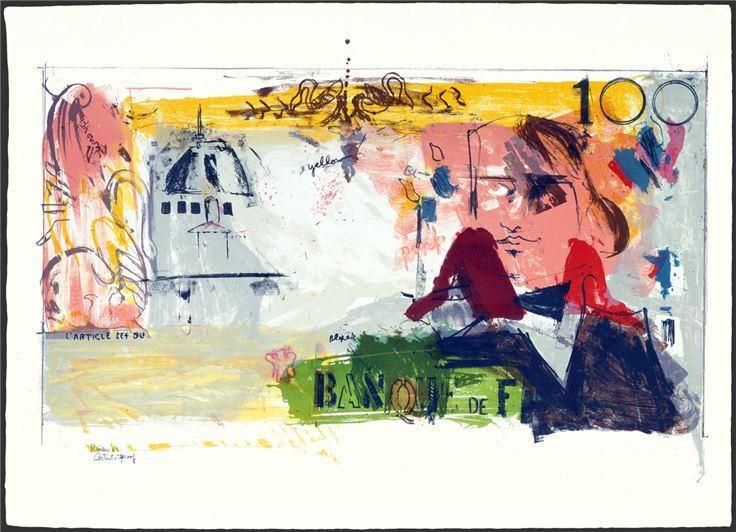 Shown in the kitchen is a reproduction of “French Money” by Larry Rivers, also provided by Film Art LA according to the Set Decorator’s Society of America article. It kind of looks the same? Perhaps the angle squished it in the still above? 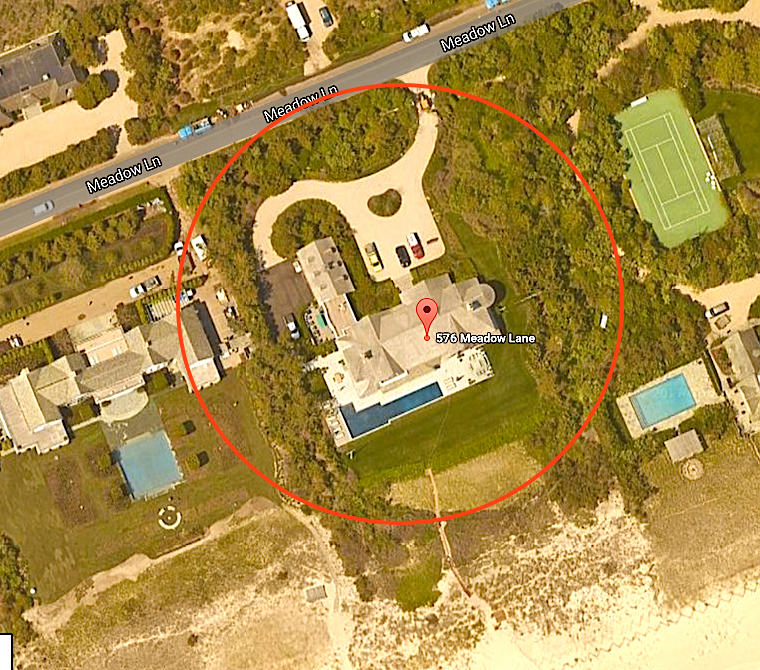 Taking a bit of a step back, the house exterior was a real house in the Hamptons, which last sold in 2014 for an astounding $41M to Jimmy Tisch, CEO of Loews Corporation. Hard to imagine a playwright (Diane Keaton’s character Erika Barry) could swing this place – even a hugely successful one. The interiors of the house weren’t really designed to match the exteriors. 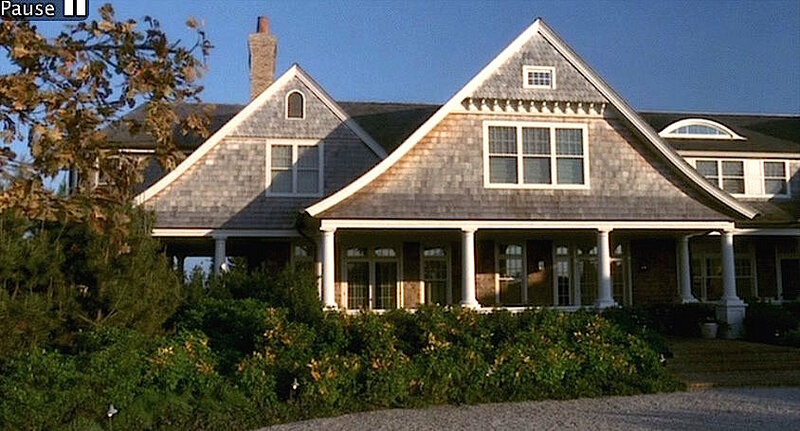 They were allowed to go inside and dress the windows to look like the interiors sets, but when they filmed, it was all outside on the porch and in the driveway. As mentioned above, the counters were painted to look like soapstone and they were also on casters to be moveable. 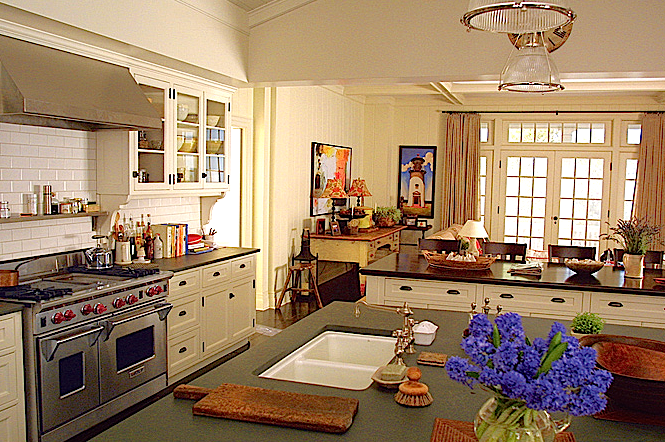 Otherwise, isn’t this fabulous kitchen? 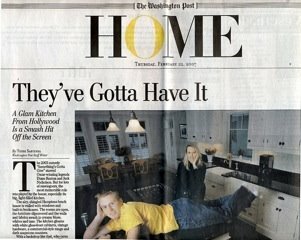 Shortly after my initial blog post about the movie, I was interviewed by Terri Sapienza of the Washington Post about the popularity of this kitchen in an article appropriately titled They’ve Gotta Have It. As the articled showed, many, many homeowners were asking for the look of this kitchen, and the whole house, as they contemplated their own remodels. I would say that it’s just beginning to look a little bit dated with the dark oiled bronze hardware and the light fixtures – but those would be relatively easy fixes. 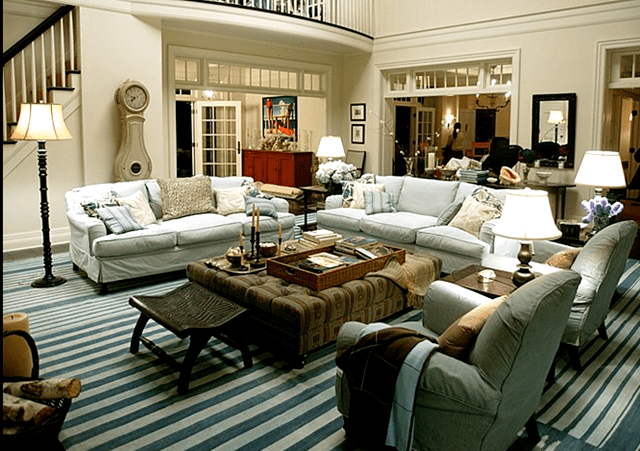 It’s clear from the various images of the living room that the blue and white striped dhurrie rug was pieced together. 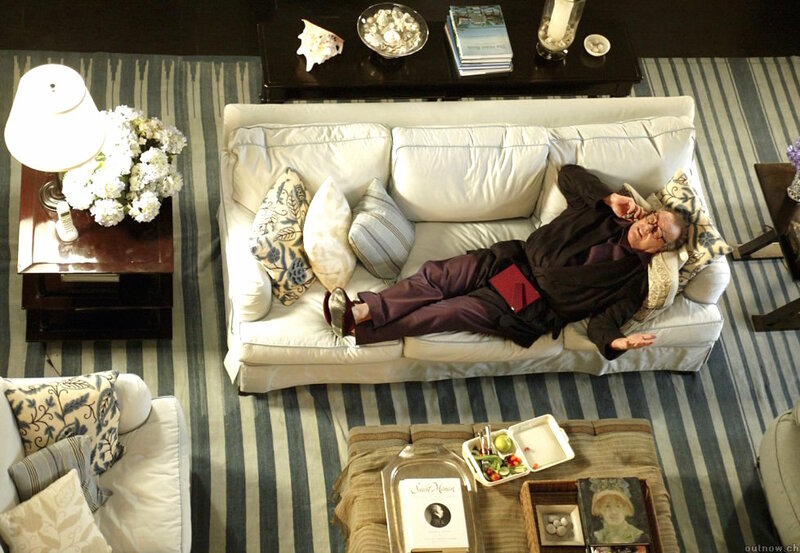 Set Decorator Beth Rubino shared that the rug was a huge (I mean huge like 70 feet long huge!) antique rug which they had cut and restitched together to fit the large living room set. When people started looking for the rug, they realized fairly quickly that it wasn’t actually available. Someone went to the folks at Aspen Carpet Designs who specializes in custom made flat weaves and dhurries and asked them to replicate the rug. 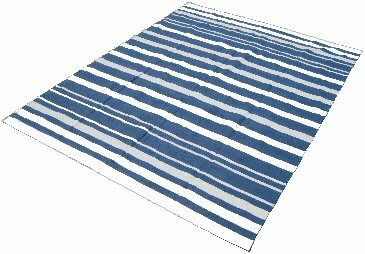 Thus began quite a cottage industry in making Beach House flat weave rugs in varying shades of blue. If you order from Aspen Carpet Designs, tell them I sent you! 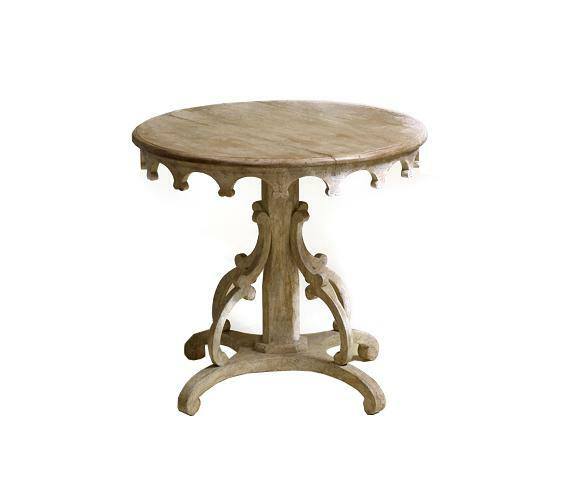 In the master bedroom is this sweet Nantucket Side Table by Rose Tarlow. Rose Tarlow is only available to the trade. I can make purchases for anyone who might be interested, however, I will warn you, it’s $$$$ – as in with tax and shipping/freight, it would be in the high four-figures. The fabric used on the dining room chair slipcovers was also a hit. 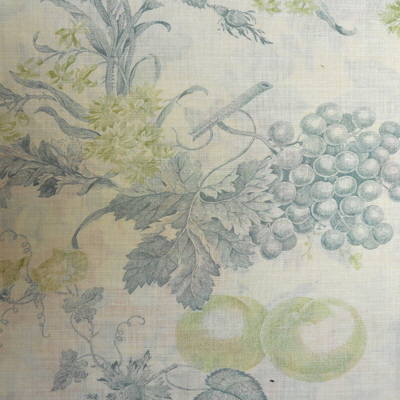 This was Lee Jofa’s Bordeaux Toile – which they unfortunately discontinued a few years ago. I received many, many requests for the fabric and actually sold 22 yards to a client in Australia! (That was quite something to see me checking 22 yards of fabric before I shipped it off across the world to be sure it was okay). Unfortunately, most of those interested in the fabric weren’t prepared for the $150+ per yard price tag. 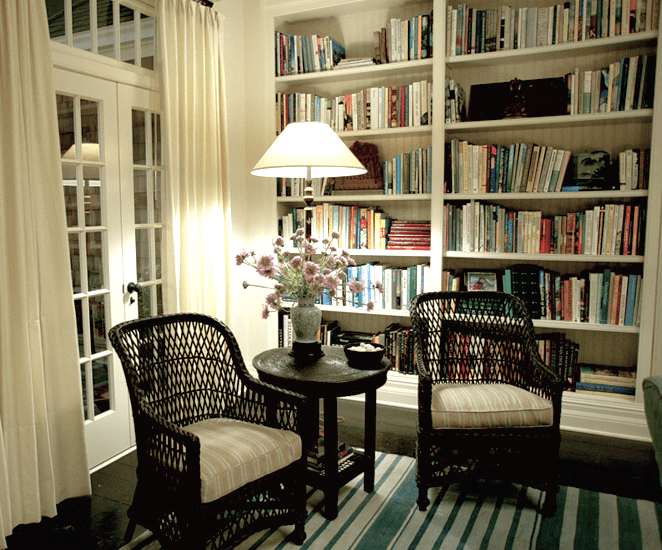 It is what it is – decorator fabric can be very expensive. I do wish they’d bring this back though. I always thought this image above was the entirety of the decorating scheme all in picnic form. You can also infer from their costumes that this is where they truly start being in synch with one another. I’ve put together two rooms plans inspired by the Something’s Gotta Give Living Room and Bedroom over at The Design Network. Just click the images to be taken to these plans which have all the links with details and shopping lists. Please note that I am paid a commission on any sales, at no additional cost to the purchaser. This helps support this blog. Thank you! That was a beautiful movie set. I am always in awe of set decorators and designers who can come up with such beautiful and imaginative things. 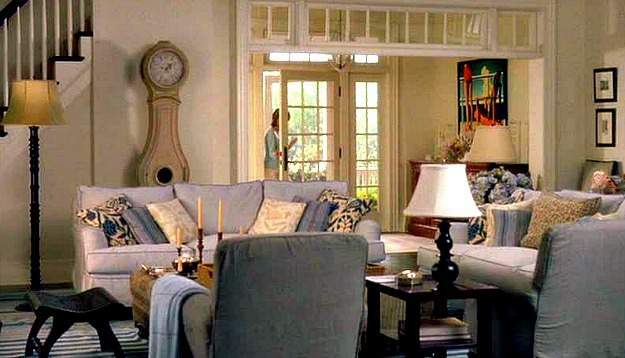 My absolute favorite set design and decoration is from the movie Someone To Watch Over Me, which was released in the ’80’s, I believe. 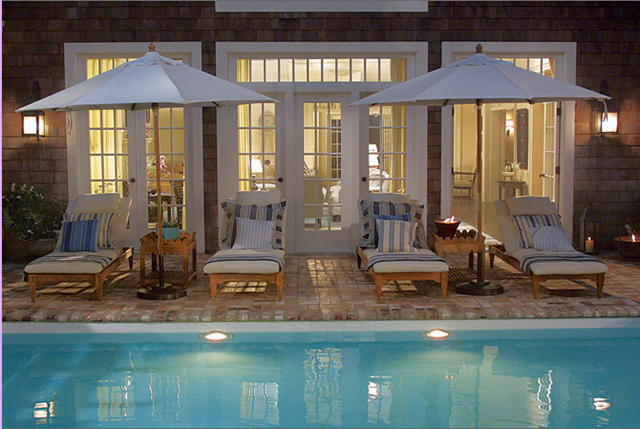 Mimi Rogers’ character, Claire, has the most exquisite townhouse that I have ever seen. Check it out if you haven’t already. Occasionally I catch the movie when it pops up on my radar, just to see the interiors. Although I am not a decorator, to me it has a timeless quality that has held up extremely well over 30 years. Hi Lisa – I’ve heard “Someone to Watch Over Me” has beautiful sets. I recall seeing the movie, maybe on tv, a long time ago. But I don’t really remember it. I’ll have to see if I can find it somewhere. Thanks! Are you familiar with the artist Jack Vettriano? 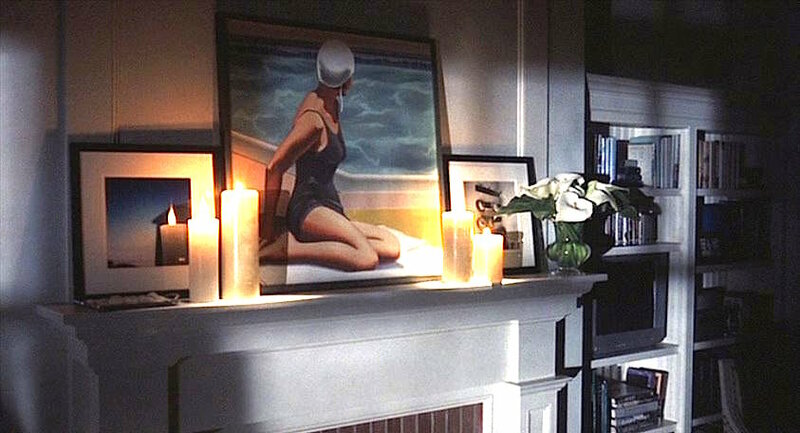 Very similar style to R Kenton Nelson and the actor Jack Nicholson owns some of his original work. His prints are affordable. Great post! You mentioned that oil rubbed bronze has become dated – yikes! We’ve just been transplanted from the west coast to the east coast, and I’m trying to understand east coast style. I like the SGG style and want to use it as inspiration to decorate our 1895 house. I thought that oil rubbed bronze or black metal finishes would be appropriate, but maybe that’s not a good idea if oil rubbed bronze has become dated. You wrote that there could be easy fixes for this and the dated light fixtures. What would be a better finish now? Hi Sandy – I was thinking that the updates might be brass fixtures and hardware, which is so popular right now. But I think black wrought iron finishes are a timeless choice as well! 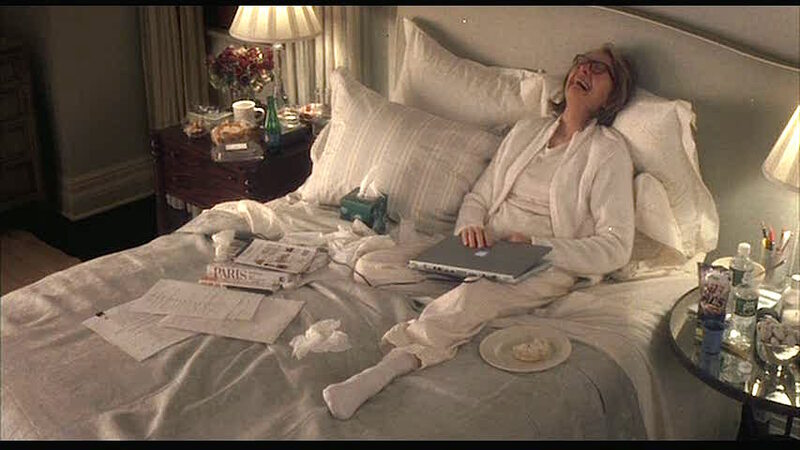 I would love to know what kind of sheets were used on the bed. They looks so comfortable and they had a nice sheen to them. I lov tge movie and have watched it many times. I would love to live in a house like that one. 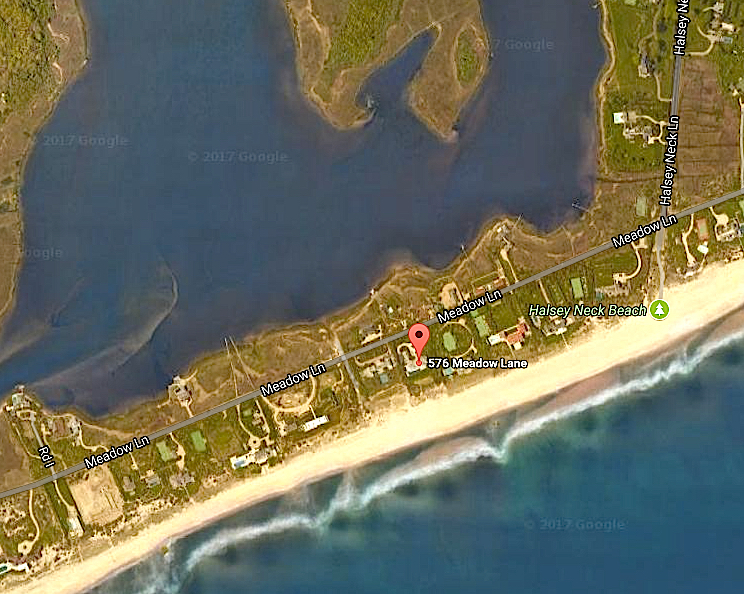 Hi Michelle – I think many of us would love to live in that house. Sadly, no idea about the sheets – sorry! I really love the cream desk chair in the bed room, any idea wear I can buy it? 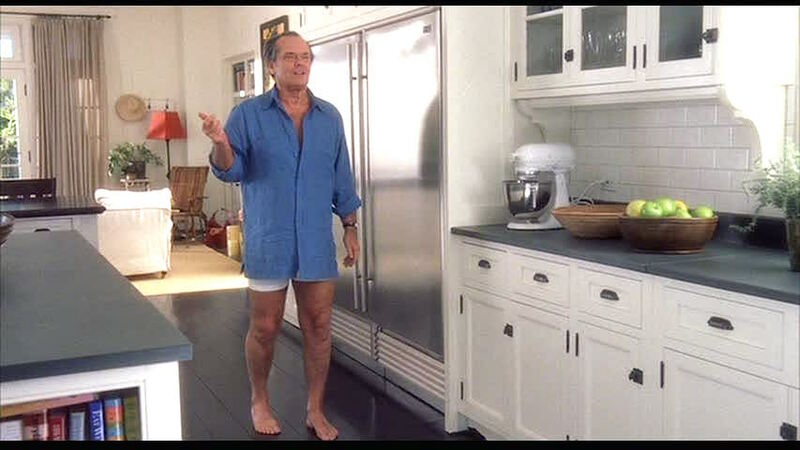 Hi Linda, do you know anything about the drapes and hardware that seem to be consistent with Nancy Meyers movies? They all seem to be a light neutral color with the black hardware, and always hung close to the ceilings. Do you know the brands, and/or colors? Hi Christine – I imagine they are all custom made – she definitely does have a look! They are probably linen or cotton/linen blends in natural colors – cream and white. Restoration Hardware and Ballard Designs do the same kind of simple pinch pleat drapery to measure. They would also have similar simple rods. You might also ask a local decorator to have them made for you as well. Good Luck!